Though both H.264 and MP4 are popular formats, and sometimes, MP4 format is a popular choice for H.264 format, they are not the same. H.264 also appear in AVI, AVCHD, MKV, MOV etc. In some cases, you will need to enocde H.264 to MP4 format. For example, when the H.264 HD video comes in huge size and not suitable for your mobile storage. 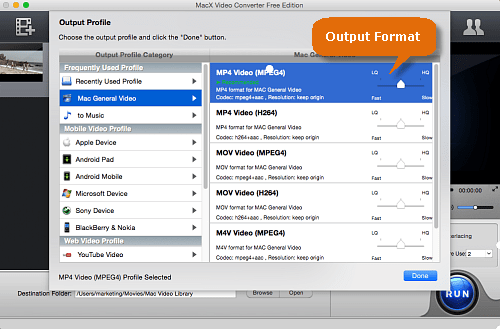 To that end, a MP4 free converter will easily convert h.264 to mp4 on Mac/PC freely, with smaller size and high quality. 4) 180+ video and 14+ audio formats supported. H.264 (MPEG-4 Part 10 or MPEG-4 AVC), is a popular compress/codec used for recording, compress and distribute high quality videos. As a part of MPEG-4, H.264 has more advanced compression methods than other basic MPEG-4 compression. It is widely used for online video streaming from YouTube, Vimeo, iTunes, encoding and decoding HD DVDs/Blu-ray, BD players, HDTV, AVCHD recorders and more. MP4 (MPEG-4 Part 14) is a multimedia container format standard specified as a part of MPEG-4. It can contain multiple video and audio streams, subtitles, still images, and other data in one file. Same to H.264, MP4 is widely used over the internet, for iPhone, iPad, mobiles, TV and more. But MP4 is different to H.264 in aspects like file size, quality thus lead to the need to convert H.264 to MP4 on Mac/PC. You may wanna know: h264 vs h265, h264 vs mpeg4. The main differences between H.264 and MP4 is as follows. 1. H.264 is more efficient than MP4. H.264 is an extremely efficient compression which works with bossy lossy and lossless formats. It can delivery highly compressed Lowe resolution videos for web streaming, and also high definition videos at high bitrates for HD devices. 2. H.264 has larger file size than MP4. H.264 is used for HD video compression and recorders, which can be large in size, like MKV, AVCHD, HD MOV in H.264 codec. 3. H.264 has better quality. As H.264 also works with HD resolution, it can generate higher quality than MP4. 4. H.264 takes more processing power. Especially the HD H.264 videos will require more power to decode or playback, which means that mobiles will run out of battery faster when playing H.264 than MP4. If you want to keep the high quality of H.264 at small file size as MP4 format, you can convert H.264 to MP4 mpeg4 with a free video converter. 98% quality- the high-quality engine and deinterlacing tech will reserve the highest quality after you convert h264 to mp4 on Mac/PC. Get the freeware download for free, the conversion will be done in seconds! 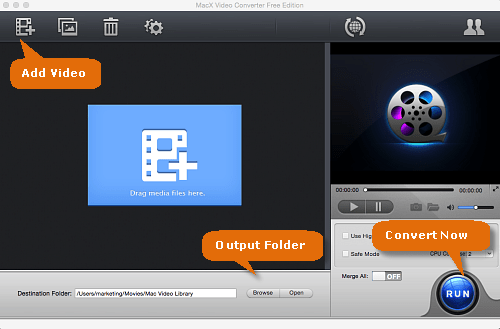 Launch the converter and click button with a plus mark to add the video. Or you can simply drag and drop your H.264 videos (multiple videos supported) to the interface. To decode H.264 to MPEG4 MP4, select MP4 format from the Mac General Video category, or under the Apple Devices etc as it is the default format of most devices. You can also freely convert among different formats, like 3gp to mp4, mpeg to mp4, H.265 to MP4, iPhone, iPad, Android, YouTube, Facebook and more. You can further edit the video if necessary. It has options for you to trim, crop, add watermark, compress video file size, lower video resolution, add subtitles to output videos etc. Click Browse to select an output folder on the computer to save the converted mp4 video. Then click Run and the freeware will start to convert h264 to mp4 on Mac/PC. The conversion will be done with fast speed, and even faster on an high-configuration computer. Free download the H.264 to (MPEG4) MP4 decoder to easily convert H264 videos like MKV, AVCHD, MOV, AVI, M4V etc to MP4 formats (as well as others like FLV, WMV, VP8, MPEG, 180+ video and 14+ audio formats). High quality but half the size reserved.